Science can be remarkable and science can be challenging. Progress is often incremental, but given the right set of circumstances can also be made in leaps and bounds. 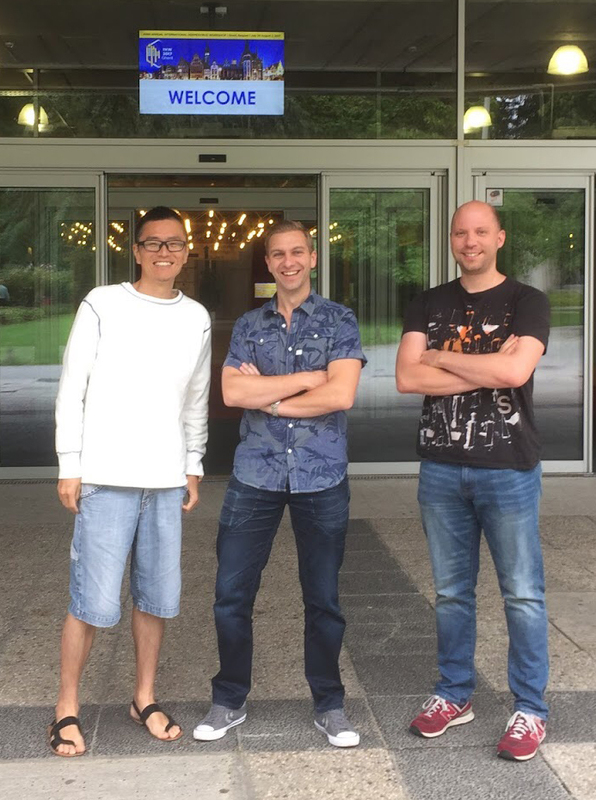 This is a tale of how an Englishman, a Dutchman, and a Japanese man walked into a bar and solved a 35 year old mystery. Varicella zoster virus (VZV) infects most of the world’s adult population, and while commonly thought of as a childhood disease (chickenpox), it remains a significant source of morbidity later in life due to its ability to establish life-long latency in sensory neurons of peripheral ganglia. In up to 30% of VZV-infected individuals, the virus will reactivate later in life to cause a different disease (shingles) that can include serious neurological complications including a chronic persistent pain condition termed post-herpetic neuralgia. Understanding and intervening against the mechanisms that allow viral reactivation remains a priority for researchers worldwide. Autumn 2015. Building upon a collaboration set up between Professors Judy Breuer (UCL, London, UK) and Georges Verjans (Erasmus MC, Rotterdam, the Netherlands), Dan Depledge (UCL) and Werner Ouwendijk (Erasmus MC) began applying the Breuer group’s recently developed highly sensitive RNA sequencing methodology (enriched for viral nucleic acids) (Depledge et. al. 2011, 2014) to latently VZV-infected cadaveric human ganglia. VZV latency research remains highly challenging due to an absence of suitable animal and in vitro models. Virtually all insight gained to date has therefore derived from analyses of latently VZV-infected cadaveric human ganglia, but cellular dysregulation following death has a major impact on the data generated (Ouwendijk et. al. 2012), particularly as post-mortem intervals increase. Moreover, in this system, the numbers of latently VZV-infected neurons are extremely low, requiring highly sensitive approaches that add further layers of complexity to an already challenging environment. Spring 2016. 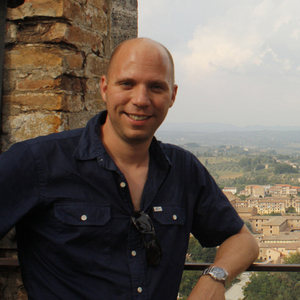 In Europe, Dan and Werner were trying to make sense of an unusual pattern of peaks observed by RNA sequencing of latently VZV-infected human ganglia, by combining improved RNA sequencing analysis methods with classical molecular biological approaches. On the other side of the world, Tomohiko Sadaoka (Kobe University, Kobe, Japan) was exploring de novo antisense transcription during VZV productive infection since 2012 and had begun developing an in vitro human neuronal VZV latency model to explore the links between transcription and latency. In retrospect, what remains most remarkable is that the VZV latency-associated transcript (VLT, Figure 1) has existed under our noses all this time. Its genomic location, antisense to an immediate-early viral transactivator, is conserved amongst most other alphaherpesviruses and it is also detectable during productive infections as a late-expressed gene. However, it's unusual (for a herpesvirus) multi-exon structure provided a natural barrier to older methodologies and our discovery was only made possible by the combination of cutting-edge sequencing approaches, and the availability of unique human ganglia specimens obtained within the first few hours of death. Figure 1: VZV transcriptome profiling during lytic and latent infection. Strand-specific mRNA-Seq of lytically VZV-infected epithelial cells and latently VZV-infected human trigeminal ganglia (TG). The VZV genome is shown as a blue band; sense and antisense open reading frames (ORFs) indicated as dark grey and light grey blocks, respectively, with internal tracks (red) revealing the lytic and latent transcriptomes using VZV RNA-enriched libraries. 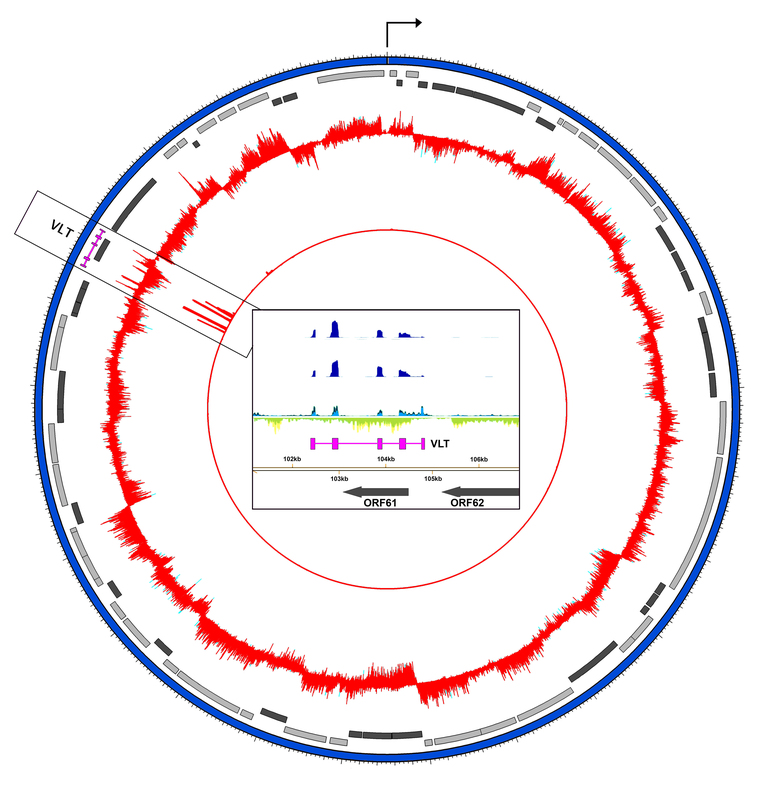 The black arrow indicates the canonical VZV genome start site. The newly identified VZV latency-associated transcript (VLT) is highlighted in the black box [centre] which shows a linear representation of the VLT genomic region. Blue and yellow tracks depict VZV RNA-enriched sequence reads originating from the top and bottom strand, respectively. Unenriched mRNA-Seq trakcs are superimposed and shown in light blue (sense) or green (antisense). Grey arrows indicate VZV ORFs in this locus, while VLT is indicated by the connected purple boxes. Summer 2016. Madison, Wisconsin. Dan and Tomo finally meet in person, having just published a new in vitro model for studying VZV latency [Sadaoka et. al. 2016]. They sit down in the aforementioned bar with Werner and quickly come to realise that they have identified the same VZV transcript, through different methodologies and in different life cycle stages of VZV: productive vs. latent infection. A quick meeting of postdocs and PIs resulted in an agreement to pool knowledge and resources and collaborate to finish this study together. Our identification of VLT is a first, but crucial step, in elucidating how VZV latency and reactivation are regulated. The task now becomes to discern the function(s) of VLT and relate this to the latency transcripts of other herpesviruses in the context of viral latency, pathology and evolution. In terms of lessons learned. Academia teaches us to be careful and conservative with unpublished data, but science is weakest in isolation. The strength of our study came from our differing perspectives and expertise, but perhaps most importantly, our willingness to share authorships and to build a collaborative framework (which remains in place as we advance our studies further) was key to success. That and having great mentors (Professors Judy Breuer and Georges Verjans) and collaborators (Professors Randall Cohrs and Yasuko Mori) who gave us space and time to develop this work. Congratulations guys! Looking forward to digesting in detail. Thanks David, it was a great collaboration and project! Great example of the power of collaboration. Congratulations to all of you!